Looking for asbestos consultants to test a building for asbestos? Our asbestos consultants can help you to identify asbestos containing materials (ACMs) and, if present, manage these and/or safely remove them. The purpose of an Asbestos Management Survey is to locate (as far as is reasonably practicable) the presence, extent and condition of any suspected Asbestos Containing Material (ACM) in the building, which could be damaged or disturbed during normal occupancy – including foreseeable maintenance works. If we complete an asbestos management survey for you it will usually involve sampling and analysis to confirm the presence or absence of ACMs. 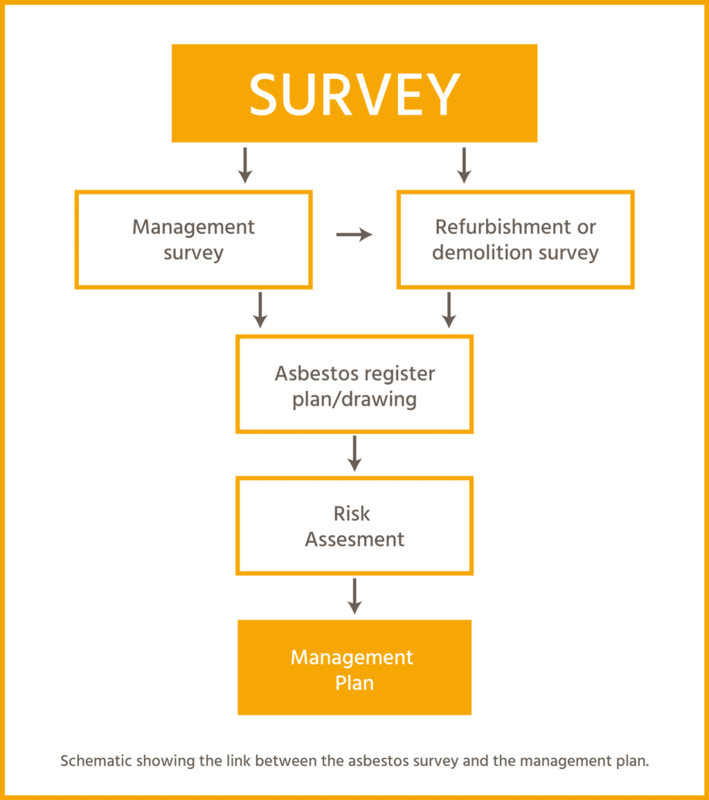 The survey and report will provide sufficient information to assist you and us to develop an Asbestos Management Plan to manage the risks. If you’re planning any refurbishment or demolition work, you will require a Demolition or Refurbishment Survey in advance of this work – this type of survey may also be required in other circumstances e.g. for items such as plant regardless of whether an Asbestos Management Survey has been completed. The purpose of a Demolition or Refurbishment survey is to locate and describe all “Asbestos Containing Material” (ACM) in the areas where refurbishment will take place or, in the case of demolition, the entire building or part of the building being demolished. This type of survey is fully intrusive which means we will need to carry out a destructive investigation and to gain access to all areas including those that are otherwise difficult to reach and which would typically not normally be covered by an Asbestos Management Survey. We will produce an Asbestos Register once ACM is confirmed in a building. It’s important that this is kept onsite to inform those parties engaged to work on your building, such as consultants and contractors, of the presence of such. This will ensure that they can take the necessary measures to treat the material and make sure that no contamination of the building or space where the material exists occurs as a result of disturbance or damage. The Asbestos Register is a live document that we, and your other consultants and contractors, will update as material is identified and removed from your building or site. Ensure a copy of the plan is readily accessible on site. As part of producing an Asbestos Management Plan, we will also produce an Asbestos Register when ACM is confirmed in a building. It’s important that the Asbestos Management Plan is kept onsite to inform occupants and those working on, or around, the building of the presence of such. This will ensure that they can take the necessary measures to make sure that no contamination of the building or space where the material exists occurs as a result of a disturbance or damage. The Asbestos Management Plan is a live document that we, and your other consultants and contractors, will update as material is identified and removed from your building or site. In situations where we identify asbestos, we will complete a Risk and Management Assessment. This will provide you with site-specific, risk-based data for the working with, or removal, of ACM in advance of works and will include suggestions of possible methods of treatment. We can review contractors’ site specific method statements and Asbestos Removal Control Plans to ensure these comply with both legislative requirements and best practice. This will provide you with confidence that the work is going to be completed in a safe and compliant manner thereby protecting you from the onerous implications of not doing so. We are often engaged to monitor works during the removal or treatment of products to ensure the correct procedures are followed, so that no one is inadvertently ‘exposed’ to asbestos. Engaging us in this role is your insurance policy to ensure the work is carried out properly and in accordance with previously agreed Method Statements and Plans of Work. Upon completion of asbestos removal works, you’ll need confirmation that all asbestos has been successfully removed and that contamination has not occurred as a result of a release of fibres. We can provide you with clearance certification. In order to provide this, we will need to go through a staged investigation process of the work area to confirm successful decontamination and that spaces are fit for re-occupation. This process may involve swab sampling and air testing depending upon the level of asbestos removal works. Maynard Marks can assist you with the identification, management, removal and provision of clearance certification for Asbestos. Engaging Maynard Marks to initially complete an Asbestos Management Survey (also known as Asbestos Risk Assessment Report) will enable you to become aware of and then to manage asbestos containing materials (ACM) during the normal occupation and use of a premise. Our Asbestos Management Surveys will satisfy the Health & Safety at Work (Asbestos) Regulations 2016 (Regulation 10) which requires that “A Person Conducting a Business or Undertaking (PCBU) with management or control of a workplace who knows or ought reasonably to know that there is a risk of exposure to respirable asbestos fibres in the workplace must ensure, so far as is reasonably practicable, that all asbestos or ACM giving rise to the risk at the workplace is identified”. If you are planning any refurbishment or demolition work on any building (including residential dwellings or homes) or plant, constructed or installed before 1 January 2000, the Regulations (Subpart 4) also state that a PCBU must not carry out any work until the structure or plant is inspected for asbestos by a “competent person”. If asbestos is identified prior to any refurbishment or demolition work, in the areas affected by the proposed work then the asbestos must be removed before any other work commences. The process to complete a Refurbishment or Demolition Survey will involve more extensive and intrusive investigative work, which would not necessarily have been completed during the Asbestos Management Survey. Our team of Asbestos Surveyors can provide Refurbishment or Demolition Surveys and are independent “Licensed Asbestos Assessors” by WorkSafe New Zealand. We can therefore also complete Clearance Inspections and issue Clearance Certificates for all types of Asbestos removal works. The benefit of engaging Maynard Marks is that we employ a large team of Licensed Asbestos Assessors with the globally recognised British Occupational Hygiene Society (BOHS) P402 and P405 qualifications in the surveying, sampling and management of asbestos in buildings. Our surveyors work to the highest industry standards and follow the Worksafe New Zealand Approved Code of Practice: Management and Removal of Asbestos, when completing survey work, reporting and when involved in the management of works for the removal or other treatment of Asbestos, ultimately providing you peace of mind.